Regardless of map privileges you have set for another user, there are additional sharing options you can set for each layer individually. Select layer on the Layer list. Write username of the user you want to share layer with. Can view – will allow the person you have shared your map with only viewing privileges of specified layer, without possibility to edit or export it. E.g. If you gave other user edit privileges to the map, but want to make restricted privileges for a specific layer. Can share – will provide sharing privileges to the person you have shared your layer with. E.g. If you gave view privileges to the map, but want to enable other user to share a layer to another user. Person with share privileges can share layer to another user and assign him the same permissions he got from the layer owner. Can edit – will provide the person you have shared your map with complete editing privileges of specified layer. E.g. If you gave other user view privileges to the map, but want him to be able to edit a specific layer. Can export – will allow the person to export specific layers from the map you have shared with him. E.g. If you gave other user view privileges to the map, but want him to be able to export a specific layer. Can collect – will allow the person in the field to send new data to a specific layer, but without possibility to make changes to existing data or the one that he already sent through Mobile Data Collection application. Can update – will allow the person in the field to make attribute and geometry changes for features in a specific layer, but without the possibility to send new data through Mobile Data Collection application. 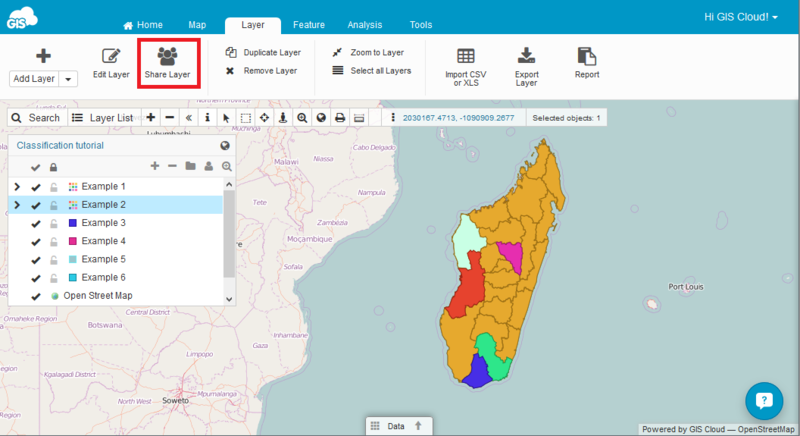 Publicly available – makes the layer publicly available for all GIS Cloud users. After making layer public, it’s also possible to choose between view, edit and/or export privileges. Note: Sharing Layer and Sharing Layer’s data source is not the same option. Shared layer will allow other user to use layer only inside the map which you also need to share with him. Shared data source allows other user to use layer in any map, his own or the ones shared to him with edit privileges.